Congratulations on declaring your major! Now that you’ve begun to narrow down your academic focus, you may be starting to think about ways to explore bringing your academic interests to the professional world. Whether you’re exploring majors or concentrations, searching for information about your general interest areas, you might like What Can I Do with This Major? This website is a great brainstorming resource to help you connect majors to potential career paths. Learn about typical career areas and types of employers that hire people with each major, as well as strategies to make you a more marketable candidate. Remember, these lists aren’t all-inclusive, but they’ll give you a sense of where you can apply your academic interests in workplace settings. Pro-Tip: If you’re looking to connect this information back to your intended major or concentration, check out our major tip sheets! These tip sheets will give you a snapshot of the employers and graduate schools where recent Columbia alumni have brought their degrees. Plus, they’ll help you articulate the competencies you bring from your studies to the world of work! Win-win. We’re huge fans of seeking out alumni stories as part of career exploration—they can help bring the career-related research you’re doing alive. You’re in luck! Alumni often love giving advice and sharing their experiences with current students. Use the alumni profiles on our website to learn about alumni career paths and pick up gems of advice. See what alumni majored in, where they went on to work, and what they did during their time at Columbia to explore, gain experience, and connect their academic experiences to the workplace. You’ll find out how a political science major became an executive recruiter, a chemical engineering major became a global resource planner, a psychology major became a clinical research assistant, a mechanical engineering major became a cloud advisory consultant, and an English major went on to work at a talent agency—just to name a few. You can also read about alumni career paths on In the Know posts like this one on four alumni connecting their history major to their careers. On the topic of alumni profiles, there are thousands of them on LinkedIn, a professional networking site. One of our favorite things to use LinkedIn for is research. 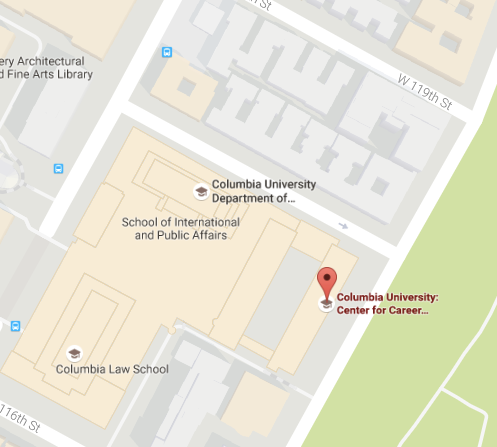 Search for Columbia University, and click “see alumni”—from there you can search for alumni by keywords, industries, companies, locations, and more. For instance, search Mechanical Engineer and you’ll find a snapshot of graduates at companies like Tesla, BuroHappold, and GE Power. Click on the individual profiles to read about an alum’s career path, and join groups like Columbia Career Connections and the Columbia Alumni Association Network to connect! Find someone super fascinating you’d like to learn more from? Consider reaching out for an informational interview—a chat to learn more about their career trajectory and job, and pick their brain for advice and answers to your industry-, job-, or company-specific questions. Another great resource for Columbia College students looking to connect with alumni is the new Odyssey Mentoring Program. Looking for solid career information online? O*Net is a great place to start. The system has detailed descriptions of the world of work for use by students. While it’s a great site to click through, visiting Advanced Search and the Interests tab gives you a chance to connect your basic interests to a variety of career paths, then read about those paths and learn about the skills, qualities, and educational requirements to break into the field. If you’re just starting this process, meeting with a career counselor during a 30-minute appointment can help you to explore your interests and learn about options. You can find out more about career counseling and career assessments on our website!